Four men were found guilty Monday of plotting to bomb London's public transport system on July 21, 2005, two weeks after a coordinated suicide bombing attack on the network killed 52 commuters. The jury was still deliberating on two co-defendants — Manfo Kwaku Asiedu, 34; and Adel Yahya, 24 — but decisions were not expected Monday. The men were accused of attempting to detonate explosives-laden backpacks on three subway trains and a bus in a mirror image of the July 7, 2005 attacks. The devices — made from a volatile mix of hydrogen peroxide and flour — failed to explode, and no one was injured. 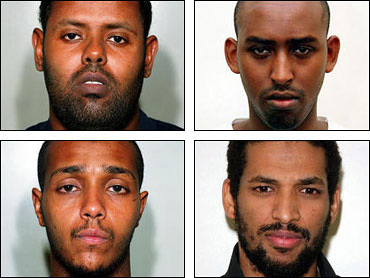 Convicted of conspiracy to murder were Muktar Said Ibrahim, 29; Yassin Omar, 26; and Ramzi Mohammed, 25. Several hours later the jury returned another guilty verdict against Hussain Osman, 28, accused of trying to detonate a bomb on a third subway train. Judge Adrian Fulford told the jury of nine women and three men after their initial three verdicts that he would accept 10-2 majority verdicts on the other three defendants. Police said scientific tests on the devices proved they were all viable. They do not know why they failed. However, British media reported that constructing a functional bomb using the chosen materials would require considerable chemistry knowledge and precision. The botched plot rattled a city already shaken by the July 7 attacks, as Scotland Yard detectives launched the biggest manhunt in British history. Much of the prosecution's case was based on eyewitness testimony and closed circuit television footage from the targeted subway cars and bus. In one of the most chilling pieces of footage, Mohammed attempts to detonate his charge with his backpack facing a mother and young child. Moments later, passengers are seen running to the other side of a carriage, while an off duty firefighter, Angus Campbell, confronts Mohammed. A day after the failed attacks, police shot dead a Brazilian electrician aboard a Tube train after mistaking him for one of the bombers. Police said they were under enormous pressure to capture the men, uncertain over whether they would try again and anxious to avoid a repeat of the aftermath of the hunt for terrorists responsible for the 2004 Madrid train bombings. Then, suspects killed a police officer and themselves when they exploded booby traps as police stormed their hideout. Giving evidence in the trial, a specialist firearms officer, identified only as PC 7512, described how he almost shot Omar dead when he found him standing in a bathtub, fully clothed and wearing a backpack. "In all honesty, I still don't know to this day how I did not shoot him," said the officer, describing how his Heckler and Koch carbine submachine gun was trained on Omar's head. Police believe the planning for the attack started after Ibrahim returned to Britain from a trip to Pakistan in March 2005. He was in the country at the same time as two of the July 7 bombers — Shezhad Tanweer and Mohammed Sidique Khan — but officials do not know if they ever met. They believe the transit system was not the original target, but was chosen following the successful attacks two weeks earlier. Their original target is unknown.